Right on the Nail: Right on the Nail ~ What Nail Products Do I Use? What Products am I Loving? Right on the Nail ~ What Nail Products Do I Use? What Products am I Loving? Hi guys! Tonight I'm doing something different again. I've never sat down and talked about the products (i.e. basecoats, topcoats, cuticle care) that I've been using and loving lately. In order to have healthy and attractive nails, it all starts with cuticle care. I probably do a lot more than the average person, but I'm sure some bloggers are much more careful than I am. I work in science and use nitrile gloves on a daily basis. I also happen to wash my hands a crazy amount. Every time I take my gloves off, or touch anything in the lab, I have to wash my hands. If I'm not in the lab, I'm on the computer and nobody wants to have really greasy hand lotion or cuticle oils on their hands before getting on the computer. The first step in cuticle care is to push back your cuticles. I do this about once a week, but unless you're taking macro photos of your hands, you don't need to do it this often. I had a love affair with Blue Cross Cuticle Remover which comes in a huge jug at Sally's Beauty Supply, but the one thing I didn't love about it was how watery it was. To get around this problem I started using Sally Hansen Instant Cuticle Remover which is a gel formula. I push my cuticles back with 2 different types of cuticle pushers shown above. The larger scoop one is fairly new to me and is now a staple. You can find these products anywhere from your local drugstore to Target. After I push my cuticles back, I apply cuticle oil. I used to love the oil from the indie brand Northern Star, but they have been closed since December from persistent illness. Heather's Hues has a great oil called Cutie-cle Oil that is not too greasy, and is still very moisturizing! You can get it in several different containers, and I've been enjoying the click brush for easy application. 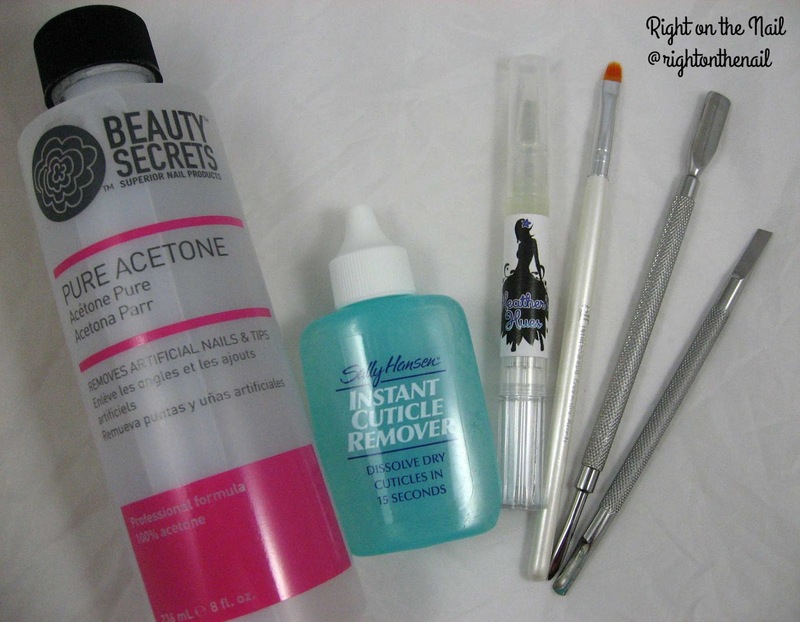 The last 2 products in the picture aren't actually good for your cuticles, but if you need to easily fix any mistakes in you have in your manicure, definitely use 100% acetone (any brand) and not anything just labeled acetone or polish remover. I've found that the ELF Concealer Brush to be a perfect size for swiping around my cuticle area and it's only $1! Other indie brands have brushes you can use, but I can't vouch for them. I think I stocked up on these brushes last year so I have about 4 of them. Of course, use more of the cuticle oil after you use the acetone as well. Oh topcoats and basecoats. Everyone has their own favorites, and body chemistry can make something I love chip on you like crazy. Your mileage may vary in this department. If you wear glitter polishes often, or you just like to change your color every couple days, then UNT Ready For Takeoff peel-off basecoat is for you. No more glue-based peel-off basecoats for this gal! It's a little pricey ($10), but it's totally worth it for me. I've also been using the JINSoon Power Coat basecoat as an extra little treatment for my nails when I don't feel like using the peel-off basecoat. If you asked me what product I've used the most bottles of over the years of blogging, I can easily answer ACI Gelous Nail Gel. You can use it as a basecoat or a topcoat, but I think it's most often used over glitter polishes to smooth them out. I'm weird because I don't really mind the texture of glitter on my nails. And finally, I will discuss topcoats. Seche Vite used to reign as the best quick-dry topcoat, but people found it to get really thick halfway through a bottle, and then there's the whole shrinkage problem. I used Poshe for a couple years when I first started blogging (and I still love it today! ), but other brands have impressed me in recent years. A few popular indie brands have their own topcoats, but several aren't 3 or 5-free. I've made the conscious decision to be at least 3-free when it comes to basecoats and topcoats since I use those pretty much every single day. Heather's Hues makes a great topcoat called Top That that is 5-free and dries pretty quickly and doesn't dull holo polishes (it also claims not to smear nail art, but I don't really do art very awesome). Zoya also has a newer topcoat from their Naked Manicure line that works well with most polishes, especially Zoyas. I totally forgot to add INM Out the Door Fast Drying Top Coat to the pictures! I believe this is exclusively found at Sally's Beauty Supply. Did you happen to make it to the end of thif ? I didn't mean for this to be so long, but hopefully there was a little bit of info that is helpful to you! None of the links in this post are affiliate links, so click as you please.